This article was first published by China Heritage. On April 1, 1969, delegates to the Ninth Congress of the Chinese Communist Party convened in the Great Hall of the People on the western flank of Tiananmen Square. The hall had been constructed as one of the Ten Grand Edifices 十大建築 hastily constructed to celebrate the first decade of the People’s Republic of China in 1959. It was used for major meetings of the socialist party-state ever since. Enemies of the twenty-year-old Communist regime in Beijing were everywhere. In the atmosphere of extreme paranoia that marked the Cultural Revolution years (from its ideological inception in 1964 to its denouement in late 1978), unless something appeared in the pages of the People’s Daily or broadcast on Central People’s Radio it could be regarded as a state secret. Given the maelstrom of denunciations at the time, however, even what was open knowledge one day could become a secret too dangerous to know, or at least to speak about, the next. In the documentary film Morning Sun 八九點鐘的太陽 (directed by Carma Hinton, Richard Gordon and myself, excerpted below) we offer a history of that era through the fate of a small coterie of middle-school students who first called themselves Red Guards. These youthful zealots, and the millions of others they inspired with the support of Mao Zedong, were useful in disrupting the Soviet-style party system instituted in China from the 1950s — and hounding its incumbents from office, often with extreme violence — and they paved the way for the creation of a new political elite, also under the guidance of Mao and his cohort of ideological radicals. In the process, the fearsome Red Guard army was unceremoniously demobbed. Removed from the urban centres by a call from Mao for them to accept reeducation through labour under the direction of the nation’s peasants, they were ‘sent into the mountains and dispatched to the fields’ 上山下鄉. A skeleton bureaucracy remained in the cities to caretake things and a cadre unswervingly loyal to Mao was formed to run the country. By 1969, the enthusiastic rabble of young rebels who, only three years earlier, believed they were the legitimate vanguard, heirs and protectors of the Chinese revolution had learned at great cost that their day in the parhelic aura of Mao Zedong had long passed. One of their number sardonically noted the irony of 1 April 1969: on April Fool’s Day the Ninth Party Congress convened both to declare unequivocally the final victory of the Cultural Revolution and to establish the successor to Mao and his revolutionary enterprise. Despite the mood of triumphalism, both achievements were soon undone by events. As the Communist Party convenes its Nineteenth National Congress in the Chinese capital, China Heritage recalls that earlier gathering. My thanks to Nora Chang of the Long Bow Group in Boston for preparing the excepts from the documentary film Morning Sun, to Richard Rigby for alerting me to the comment by Harry Rigby, his father, on Soviet party meetings, to Sang Ye 桑曄 for providing some delightful details for our account of the 1969 Congress and to Ryan Manuel for his studious appreciation of New China Newspeak 新華文體. Since the founding of the People’s Republic, public life in China has followed the rhythms of an unelected and secretive party-state. The life of the nation is measured out in the congresses, plenums, work meetings, study sessions and ad hoc gatherings of the Chinese Communist Party, as well as in the pro forma gatherings of the quasi-ruling legislature called the National People’s Congress, supported by the impotent members of the National People’s Political Consultative Congress. Everyday life continues despite the in camera workings of the party-state, but the nation’s weal and bane depend on a cabal of leaders whose activities and lives are totally sequestered from the people over whom they rule. As the man that, in 2013, I dubbed China’s ‘Chairman of Everything’, Xi Jinping, is reaffirmed as the unrivaled head of the party-state-army of the People’s Republic, it is timely to reflect on the last Chinese leader who claimed both omniscience and omnipotence, Mao Zedong. At the time, the Ninth Party Congress of 1969 was hailed as a victorious celebration of unity coming at the successful conclusion of the Great Proletarian Cultural Revolution. In reality, within months the elites running the party-state who forged a political consensus following years of bloody violence, fell into disagreement and in 1971 the Cultural Revolution itself unravelled when Lin Biao, Mao’s hand-picked successor, figuratively and literally fell from grace, dying in a mysterious plane crash in the Mongolia. Today, the Communist Party will celebrate its latest victories and a unity forged by years of political purges. Xi Jinping will be duly re-selected as unrivaled leader of the Party. This will also usher in another five years of his stewardship both of the People’s Republic of China and its People’s Liberation Army. One of the primary threats to oligarchy was that the oligarchs would become divided, and that one from their number would defect, take leadership of the people, and overthrow the oligarchy. To prevent this occurrence, ancient Greek elites developed institutions and practices to keep themselves united. Among other things, they passed sumptuary laws, preventing extravagant displays of their wealth that might spark jealousy, and they used the secret ballot and consensus building practices to ensure that decisions didn’t lead to greater conflict within their cadre. … Ruling oligarchies like the mafia are collective and armed. If oligarchy works because its leaders institutionalize their power through law, media, and political rituals, what is to be done? How can democracy ever gain the upper hand? … political power depends on economic power. This suggests that one solution is creating a more economically equal society. The problem, of course, is that if the oligarchs are in charge, it isn’t clear why they would pass policies that would reduce their wealth and make society more equal. As long as they can keep the people divided, they have little to fear from the occasional pitchfork or protest. The preparations for the Ninth Congress were as meticulous as they were guarded. Following Spring Festival 1969, all non-government delegates gathered at secretive, isolated locations; they were cut off from their friends and families as they prepared to participate in the Congress at short notice. None of them were told when the Congress would be held, or where. Starting on the 20th of March they were transported to Beijing by PLA Air Force planes in the dead of night and billeted at hotels and guest houses that had been booked for their exclusive use. Phone lines were cut and the delegates were housed two to a room and were forbidden from leaving their billets or having any contact with the outside world. They were even told to make sure curtains were drawn before they turned on the lights in their rooms. On the afternoon of the 1st of April, delegates were suddenly informed by the Congress Secretariat that the opening ceremony of the Ninth Party Congress would be held at the Great Hall of the People from 17:00 that day. The delegates travelled to the Hall surreptitiously: buses were dispatched on serpentine routes, and unfinished subway lines were used so that other delegates could walk to the venue and enter undetected via subterranean passages. Everything was done to prevent the outside world knowing that a party congress was under way. 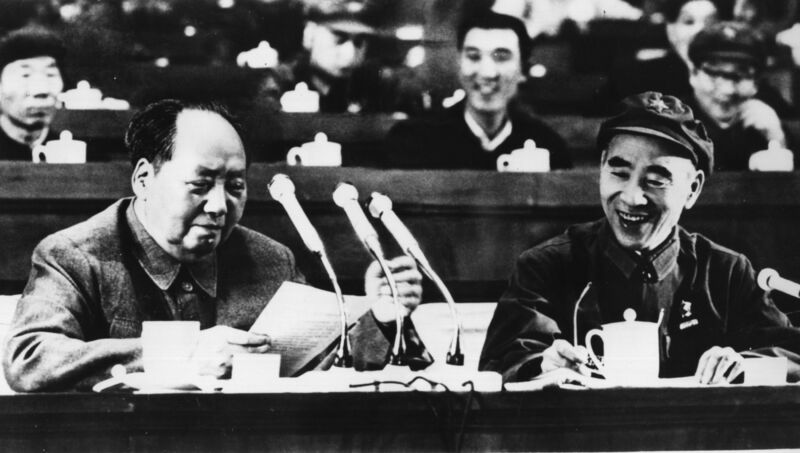 Mao was delighted with the covert operation that disguised the April Fool’s Day Congress. He remarked: ‘The foreign wire services only knew about the Congress after we announced it. They were astounded that they had no prior hint that we were about to convene. The Soviets were as taken aback as the Americans’. He had the whole performance repeated in January 1975 on the occasion of the convening of the Fourth National People’s Congress. The veil of secrecy was tightening for the First Plenum of the Ninth Party Congress that followed the formal proceedings on the grand ceremonies at the Great Hall of the People. The plenum was held in the subterranean meeting halls at Guan Yuan 官園. Following the 1966 Xingtai Earthquake 邢台地震 it was felt that Mao Zedong needed another, potentially safer home and office complex in the Chinese capital and Guan Yuan was developed as an alternative Zhongnanhai (the Lake Palaces to the west of the Forbidden City have been the headquarters of the Chinese party-state since the early 1950s). Apart from extensive living quarters and kitchens, the new Guan Yuan featured an auditorium and entertainment centre as well as spacious subterranean meeting halls. The complex was connected to Zhongnanhai by the 401 subway line. The line is now part of the Number 1 Line of the public Beijing subway, but it has its own dedicated stations and an extension to the military headquarters in the Western Hills, as well as the military centre in the Taihang Mountains. Guan Yuan was protected by a high wall with a hidden walkway for guards and surveillance points. Although Mao never lived in this home-away-from-home, it was used in 1969 for the First Plenum of the Ninth Party Congress, another even shrouded in near comical secrecy. Until the early 1980s it was official residence of Hua Guofeng 華國鋒, the final, and accidental, successor to Mao Zedong. Formerly the Melon Garden 瓜園, the western section of Guan Yuan is now the China Children’s Activity Centre 中國少年兒童活動中心 while the east is occupied by the Central Committee’s Disciplinary Commission, an organization crucial to Xi Jinping’s rule. One of Mao’s titles was Great Helmsman 偉大的舵手, Deng Xiaoping was celebrated as the Engineer-in-Chief 總設計師 of reform. At the opening of the Nineteenth Party Congress on 18 October 2017 it seemed that, since Xi Jinping set the compass for the Chinese nation, he might well become the country’s Navigator-in-Chief 領航者. As the People’s Republic, and the world, face another five years under Chairman-of-Everything Xi, more catch phrases, slogans and trite expressions that corral thought and demand adherence will gush forth from locations like the Shatan’r Compound 沙灘兒大院 in Beijing, one of the homes of the party-state’s 24/7 propaganda industry. The Chinese Communists will next convene a national congress in the second half of 2022. That occasion will mark a watershed in the life of the People’s Republic: its one-party rule will have exceeded that of the Soviet Union, its twentieth party congress will presumably gather following the achievement of the first centennial goal to achieve ‘moderate prosperity’ for the nation, and it will either see Xi Jinping retire gracefully from power after ten years at the helm, or confirm him as China’s chairman-for-life. Delegates to the Twentieth Congress of the Soviet Communist Party held in Moscow in February 1956 had no forwarning of Nikita Khrushchev’s denunciation of the personality cult of Stalin. There is no telling what awaits participants in the Twentieth Congress of China’s Communist Party. Here we offer a few choice paragraphs from Xi Jinping’s 205-minute report to the Nineteenth Communist Party Congress on the first five years of his chairmanship. They are a wordy encapsulation of the Communist Party’s theoretical approach to ruling China, a mini-compendium of political slogans and phrases, a catechism of party-speak. Above all, the speech celebrated ‘Thought for Socialism with Chinese Characteristics in the New Epoch’, i.e., Xi Jinping Thought. The speech, although long, was in short self-congratulatory. In the following translation I have turned Chairman Xi’s one-sentence paragraphs into something slightly more manageable. On the whole, Xi’s text brings to mind Clive James’ observations on Soviet-era party speeches: they were so lugubrious and long-winded that reading them out loud caused birds to fall from the sky and whirling dervishes to drop dead mid spin. In recent months friends have reported that propaganda departments at various levels of the party-state are now given to randomly selecting members of local and provincial party elites to quiz them on these and other expressions via mobile phone. Since the Eighteenth Party Congress [in October 2012] in all areas of our work developments both in China and internationally have confronted us with new challenges. These challenges have required a theoretical as well as a pragmatic response to the question of just what kind of Socialism with Chinese Characteristics will we pursue in China in this New Epoch, and how will we go about developing it? The issues that have required our consideration include the overall aims, duties, plans, strategy and direction for our unique socialist approach. Added to that is the question of how we have responded to the needs of our developmental approach, as well as how we have addressed the underpinning motivation for change, our strategic planning, an appreciation of the external conditions we face, as well as an understanding of the political stability required to ensure the continued success of our approach. Furthermore, we have successfully brought new theoretical analytical models into play when dealing with unfolding realities, ones that have informed our choices as we have engaged with all areas of policy including economics, politics, the rule of law, science and technology, culture, education, the people’s welfare, nationality issues, religion, society, environmental civilization, national security, national defense, the army, ‘One Country Two Systems’, the reunification of the motherland, united front work, diplomacy and party construction. applying dialectical materialism and historical materialism. In so doing we have unstintingly embraced the changing conditions of this era and responded to necessities posed by reality. We have re-envisioned and deepened our understanding of the laws governing Communist Party rule, socialism as well as human social development. In this process we have been painstaking in our theoretical engagement and have achieved major theoretical breakthroughs all of which have contributed to our Thought for Socialism with Chinese Characteristics in the New Epoch. Our Thought for Socialism with Chinese Characteristics in the New Epoch has built on and developed the theory of Socialism with Chinese Characteristics. Its mission is to realize socialist modernization and the grand rejuvenation of the Chinese nation. On the basis of the Moderately Prosperous Society [that we will achieve in 2020], we will, in two planned phases [in 2035 and 2050], create by mid century a modern and strong socialist country that is powerfully prosperous, democratic, harmonious and beauteous. that our strategy is ‘Four All-outs’. Confidence in our Path, Theory, System and Culture. that China’s unique Major Power diplomacy is aimed at forging a new international environment and creating a global community of shared destiny. The fundamental element of socialism with Chinese characteristics is the leadership of the Chinese Communist Party. The Party will make demands in building a Party for the New Epoch.